Requirements: 1: Passively-cooled/silent 2: HTPC with 4k playback capability 3: Potential to double up in future as a business workhorse 4: Future-proofing alongside the potential for future gaming. Having given up gaming (with the exception of Civ 3 :D ) I declined the option of a discrete GPU as the onboard HD 530 graphics that come with the i3 6100 would be able to power 4k playback and encoding. I only have a 1080p monitor at the moment but will be looking to upgrade to a 4k tv this year. An HTPC, should, of course, be as quiet as possible; one of the best advances of Skylake CPUs is their low TDP, so I thought I'd take advantage of that by building an entirely fanless, silent machine - a leap into the unknown for me, but it is my 10th build, so it feels like I'd try something different. Streacom make a range of mini-ITX form factor cases, some with fans, but some fanless, cooled by heatpipes that attach to the CPU and dissipate heat to what amounts to a radiator. More on this later. The specs and reviews differ slightly on the TDP dissipation capacity but both are well above the i3 6100 at full load. For the sakes of future-proofing (and on-board wifi), I went with the Asus Z170i Pro Gaming mini ITX, which has USB 3.1 and USB 3.0, as well as the capacity for higher frequency DDR4, and Sata Express. Possibly could have saved a few squids here but it had good reviews. It has some gaming features that I don't anticipate using but it's possible I'll go back to gaming or want to sell in the future to a gamer. I perhaps went a bit overboard with 16gb of ram, but it's pretty cheap so why not. Possible that money might have been better spent elsewhere, certainly not an expert on these things. With regards to storage, I'm using a WD 3TB external USB3.0 HDD for all my media, so didn't need a particularly big SSD, but I was planning to dual-boot W10 with Kodibuntu (or something like that), so wanted to have enough such that I wouldn't have to be constantly deleting my downloads before they can seed. M.2 fit the bill fairly well, performing better than a regular SSD, as well as not needing a power connector - this picoPSU is limited for connectors, so that played well. I considered the 950 Pro rather than 850 Evo, or the SM951, but reviews suggested that for regular users the performance benefit wasn't noticeable, and they tended to run hot - something I'd prefer to avoid in this low air-flow system. You're limited to picoPSUs with this case, but that suits me well anyway. The external power brick is where the heat radiates from; 160W is well over my power requirements, even with a half-decent (<£100) GPU. I'm not going to be using the BD-ROM/DVD Rewriter very often but I can't really call it an HTPC without one and my copy of Civ 3 is on CD so you know. RIGHT: onto the build itself. The case didn't come with enough standoffs; I had to call QuietPC and ask them to send a few more. Took apart one of my parents' ancient Dells in the meantime but the standoffs weren't the right size. Oh well, I just have to wait a few more days. The case itself is well-built. A little larger than I thought it would be but I suppose I was hoping for something more like a NUC. Still by far and away the smallest PC I've built. A little awkward inside but that's to be expected. The front-panel USB3.0 cable is very stiff and the placement on the motherboard means it's trying to flex out of its connector, but it seems to be stable and working. The biggest - essentially, only - issue is that the heatpipes were too long for this motherboard. Having spoken with technical support from QuietPC when I ordered, I felt comfortable not buying the supplementary short heatpipes, but bought them when the supplied heatpipes didn't fit. The short ones were too short, though, and wouldn't have fit anyway given the heatsink on the motherboard just north of the CPU socket. SO: operation MOD began. With pliers, I managed to change the shape of the original longer heatpipes such that they: a) cleared the heatsink, b) ended up being the right length between the socket and the radiator wall, which meant that c) I would need to rotate the flat bit on the ends such that they were flush with the radiator wall, given they were at new angles, d) all roughly had the same orientation with each other as they were supposed to (such that they could all fit with the cpu heatsink adaptor, and the radiator wall fittings), and e) vaguely had the same cylindrical shape as they originally had such that they would still transfer heat efficiently. I hadn't done anything regarding design and technology really for maybe 20 years so needless to say this was a 'faff'. A gigantic one. Took me maybe about five-six hours of patient, well-lit, well-magnified, precision plying. I don't know the dimensions of other mini-ITX motherboards but I can't imagine Streacom did a huge amount of testing with different motherboards if this not particularly rare Asus motherboard required heatpipes that were in-between the short and medium length. Fairly frustrating but I persevered and it currently works well. The rest of the build was pretty easy and straightforward. Cable management was exceptionally easy given the limited number of components. Were the heatpipes the right length, assembly wouldn't have been quite as easy and straightforward as building a regular PC but the supplied instructions were more than adequate. It's been up and running for a week or so. I've given up on my plans for dual-boot as I couldn't find a Linux kernel that recognizes the onboard wifi (W10 obviously does). Running fairly well as expected. Heat transfer works very well. By far and away the most powerful machine I've built and smashes everything I've thrown at it. Not done any proper benchmarking but could do on request. Might learn to underclock to save more power. Likely the biggest source of overkill in this build, at least for current purposes, but is good and I like. Fast as all hell. Live long and prosper, mr M.2. Love the PicoPSU and the case as a heatsink. I'm a little surprised that an Intel CPU/chipset was able to provide the best onboard graphical performance, I thought AMD APUs had the market cornered for this sort of thing. Yeah it turns out a couple of sources have suggested that amd would have been better, but I'm a sucker for intel in general. 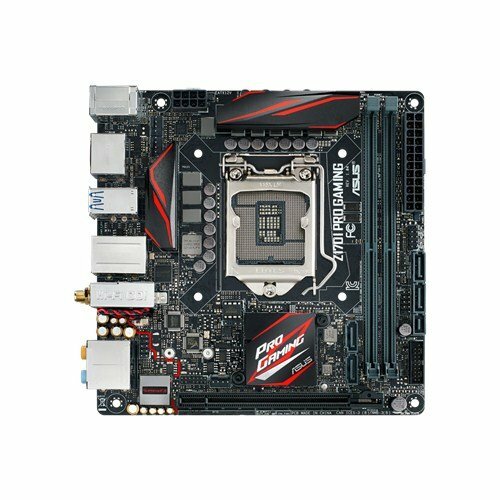 Have you had any problems using a 4-pin ATX 12v connector for that mobo given that it has a 8-pin ATX 12v connector? Nope - powered up fine, first time, think I had it as far left as it would go (with the cpu oriented beneath it), and I think I remember that that was the only way it would go in.